Did you find yourself spending a little more than you had anticipated over Christmas and the new year? It's so very easy to do, especially when you want to give all your friends and family the perfect gifts. Well, I have an easy way for you to recover from your holiday spending from the convenience of your mobile phone. Swagbucks is the web’s most popular rewards program that gives you free gift cards and cash for the everyday things you already do online. Whenever you shop, watch videos, play games or search the web, Swagbucks gives you points called SB. You can use your SB to redeem gift cards to hundreds of your favorite stores. 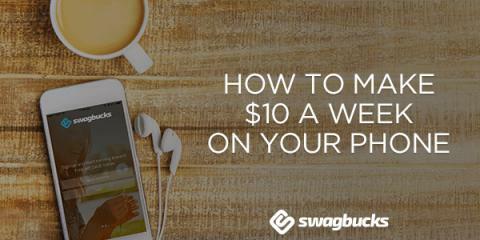 With the Swagbucks Mobile and SBTV apps I can use my spare minutes to earn free gift cards on my phone! Like the Swagbucks website, I can rack up SB by shopping, answering surveys and watching videos all from the comfort of my mobile phone. While you wait for the tea or coffee to brew, download the free games and other apps through the Discover tab and get 20 SB. During commercial breaks whilst watching your favourite soaps or TV series, take a featured survey or fill out your survey profile and get 60 SB. While standing in line at the supermarket or the huge clothes shopping queue (lets say no names! ), answer the daily poll and get 1 SB. When you’ve finally made it to the gym, watch style, tech and celeb news through the SBTV app and get 2 SB for every 6 videos. Just as you’ve put dinner in the oven, your Swagbucks app tells you there’s a new Swag Code - get 3 SB (minimum!). Before you go to sleep, use the Swagbucks app to shop from your favorite stores. You deserve it! Just by downloading the Swagbucks mobile app, I can earn a free £5 gift card by the end of my week. Who knew playing on my phone could be so productive! So why not invite your friends to download the Swagbucks Mobile app so they can start earning their way to free gift cards? In return for your great invite, you'll get referral points from those friends too! It's 100% free to download and 100% easy to use. Its available for both iPhone and Android devices so everyone (almost!) is a winner!